St. John the Baptist’s Cemetery is located on Sandridge Road directly behind the church in the Town of Alden and serves as the focal point for families who hand their deceased loved ones over to God’s Embrace. The original cemetery, which dates to 1854, constituted two acres behind the church. After 1920 when additional land was obtained, Father Mockel set to work planning and beautifying the cemetery with shrubs, trees and flowers. A stone grotto with the Pieta group, a gift of the Pfister family, was erected in June 1921. Stone was used for the arched entrance and boundary walls. Father Hagemaier had a stone altar built in the center at the intersection of the roadways. 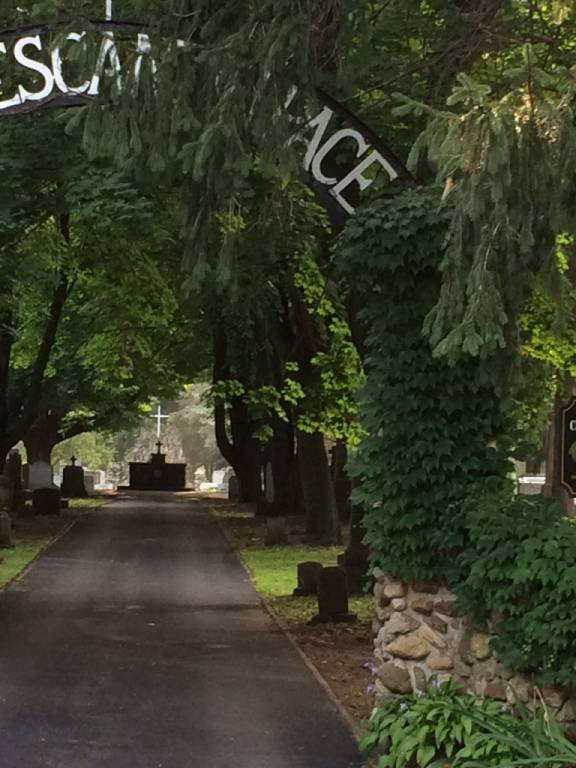 Over the years, more land was acquired and the cemetery has a beautiful calm atmosphere. This consecrated land in the cemetery continues to point to our common belief in the resurrection of the body and serves as a focal point for families who hand their deceased loved ones over to God’s embrace. Please contact the rectory at 716-937-6959 for more information regarding purchasing a grave or locating a gravesite. Plot size is 4 ft. by 11ft. Stone footing must extend beyond the stone by 2 inches on all sides and be level with the grade. Footings are to be installed by cemetery personnel only. Decorations are limited to shrubs, which must be kept trimmed by owner to a maximum height of 4 ft., and potted flowers. Use of glass vases is prohibited. The planting of flowers in the ground is prohibited. Flower pots must be removed by November 1st of each year. Vaults are required to be of concrete construction for all adult graves. Exceptions may be granted by the pastor. The price of a cemetery plot is set at $600 for parishioners and $700 for non-parishioners for all sections of the cemetery except the dedicated cremains section (the Marian Circle Section) where the cost will be $350 and $400 respectively. Price is subject to change. Fee for grave opening is set at $550 for a full body vault. The fee for cremation grave opening is $300. No fee is to be charged for a still-born grave opening. Fees are subject to change. Only one burial per lot is allowed except for children or cremation where two are permitted. Husband and wife burial – the wife shall be to the left of her husband.